U.S. 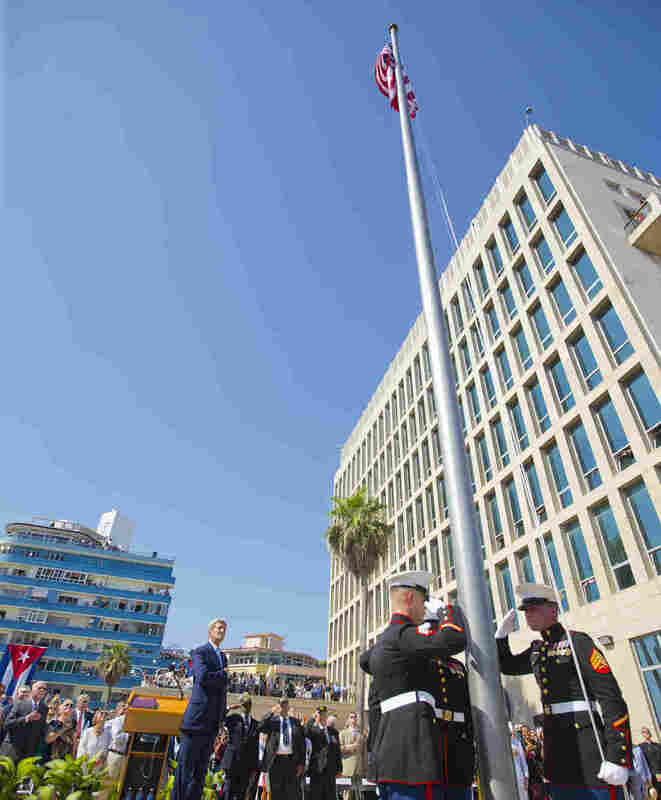 Flag Flies Over Embassy In Cuba For First Time In 54 Years : The Two-Way For the first time since 1961, when diplomatic relations between Havana and Washington were broken off, the flag flies above a U.S. diplomatic compound there. Secretary of State John Kerry (left) and other dignitaries watch the raising of the U.S. flag over the newly reopened embassy in Havana on Friday. "I was a student then and I could still remember the taut faces of our leaders," he said. "We were unsettled and uncertain about our future because we didn't know when we went to bed what we would find when we woke up." The people of Cuba "would be best served by a genuine democracy," he said, but added that it was "unrealistic" to expect Cuba to make such a transition anytime soon. "Cuba's future is for Cubans to shape," he said. Speaking in Spanish, Kerry said the ceremony showed that the U.S. and Cuba "are no longer enemies, but neighbors." Three U.S. Marines who lowered the flag at the embassy in 1961, when Havana and Washington severed diplomatic ties, accompanied Kerry to the ceremony and presented the new flag to Marines to hoist once again to the strains of the Star Spangled Banner. The Washington Post reports that the three Marines, retired Master Gunnery Sgt. Jim Tracy and then-Lance Cpl. Larry C. Morris and then-Cpl. F.W. Mike East, all now in their 70s, "will appear in Havana alongside Secretary of State John F. Kerry and raise the flag again. It has been more than 54 years since U.S. relations with Cuba were severed, but the embassy has reopened following an agreement reached earlier this year between Havana and Washington." NPR's Michele Kelemen says: "The State Department has come under criticism for not inviting leading Cuban dissidents to the embassy. Officials say that's because this is a government-to-government event. Activists are invited to a reception later, at the U.S. ambassador's residence." "Soon after Kerry heads home Friday evening, the Cuban and U.S. diplomats who negotiated the embassy reopening will launch full-time into the next phase of detente: expanding economic ties between the two nations with measures like direct flights and mail service. "The Americans also want to resolve billions of dollars in half-century-old American claims over property confiscated after the Cuban revolution. Cuba has its own claims, as noted in a newspaper column by Fidel Castro on Thursday saying the U.S. owes the island 'numerous millions of dollars" for damages caused by the embargo.'"